Continuing the saga in the Black Dog Game Factory line. The characters are now powerful elders, with fiefdoms and connections in the world of Camarilla and Sabbat. From the alleys of London to the dunes of Egypt, the characters must stop the Necromancers and foil the Giovanni plans. 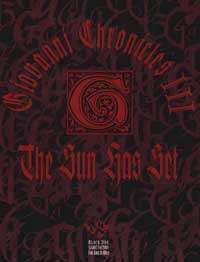 In his review, Kenneth H. may be confusing the Giovanni Chronicles with the Transylvania Chronicles; the former begins in 1444, so it is impossible to be "at least 600 years (i.e. They've participated in the full chronicle . . ." in the 1800s, when this chapter takes place. Is this a scan of the original book? fairly sure it is, but I haven't bought it yet; however, I used to own a print version of "Saga I" (Chronicles I and II) and just bought a digital copy, and it is identical to the original printing, down to a missing page in Act I.